The beauty and creativity will forever and ever last. The bond between them was almost parental. When nimble fingers are coaxing strings for perfection! The end product is fully worth the labour! It is with deep regret that I pen these few lines on music maestro Pandit W.D. Amaradeva, who passed away on November 3, 2016 at the age of 88. He died at the Sri Jayawardanapura Hospital of a heart failure. The funeral was held on Saturday at Independence Square, Colombo. “In the field of contemporary music, there is one person, who has earned the rare distinction of being admitted by artist and rasikas alike, for his dynamic influence on creation of a national tradition in music and for his incomparable virtuosity. 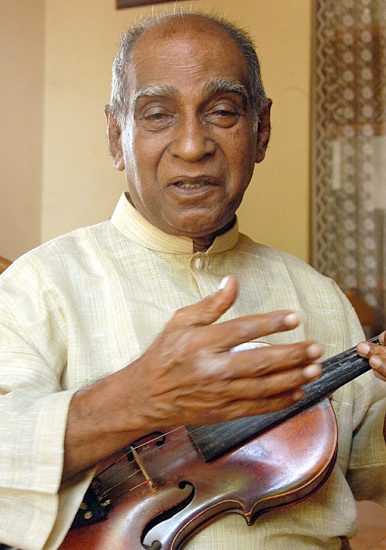 I refer to Pandit Amaradeva who was a trail blazer of Sri Lankan musical tradition as a composer, conductor, violinist and a singer over more than six decades. The above sentiments were expressed by my classmate, at Nalanda College Colombo, Professor, Dr. K.N.O. Dharmadasa when he introduced Amaradeva when conferring him the Doctorate by the University of Peradeniya, Sri Lanka. The great musician Amaradeva broadened the horizons of our indigenous music and he will live forever like all other world renowned artists. There are four important ingredients for a song.They are lyrics, melody, orchestration and vocalisation. Amaradeva was an embodiment of all four. My connection with Amaradeva began in 1970 with the Aradhana Musical Programme. Born on December 5, 1927 in Moratuwa, he was named Don Albert Perera. Music was something he inherited from his Sansaric journey. He later became a play back singer in the film Asokamala. He sang Bhave Beetha and Aikale Yamek Ale. Then in 1940, with Swarna de Silva, he sang Peenamuko Kalu Gange. Thus, began his illustrious career. His early education began with Ven. Malalankaara Nayaka Thera of Koralawella Temple. He studied at Sri Saddharmadoya Buddhist Mixed School, Sri Sumangala, Panadura, Kalutara Vidyalaya, Siddhartha Vidyalaya, Balapitiya and music at the Bhat Kande Music Institute, India. It was late Professor Ediriweera Sarachchandra who named Albert Perera as Amaradeva. One reason for the success of Amaradeva was his alliance with great lyrics writers of the calibre of Chandrarathna Manawasinghe, Mahagama Sekara, Madawala S. Ratnayake, Professor Dr. Sunil Ariyaratna and Dalton Alwis,lyric writer of Sasara Wasana Thuru. He provided music to internationally famed Vajra – Chithrasena's Nala Damayathi Karadiya, films such as Ranamuthuduwa, Ransalu. Further music directors like Premakumara Epitawella, Paneebaratha, Vasantha Kumara, Edwin Samaradiwakara and Prof. Ediriweera Sarathchandra and Lester James Peris too assisted him in a big way. He was a fine human being, who possessed a Golden Heart.One day when I went to see him, I asked Pandit Amaradeva, what he was doing these days. With an innocent smile he replied: "Epa, Me Dawaswala man alasa suwaya vidinawa”(Epa, I’m enjoying lazyness these days). Amaradeva wife's Wimala and children, Ranjana, Subahani and Priyanwadha looked after him well. W.D Amaradeva will join Panchashika and enchant heaven with his melodious music. On the "Swift sand dunes"
"Nim him sevvaa maa sasaray...."
Hema Perera, was a brilliant economist and lawyer. A man of great wit, he was a scholar in oriental languages as well. At Richmond, he was both an outstanding student, and a prankster, and was known by his initials GHH. At Peradeniya University, he excelled in his academics and was elected the President of the Communist Party earning him several trips to the Soviet Union and Eastern Europe. On graduation, he joined the Law College, where he met his wife, Mallika Perera, who was his constant partner for over 50 years. Not long after he joined the Bar, he left for the Caribbean to serve as a director at the Central Bank of Jamaica. He spent a considerable time in Jamaica, and eventually ended up as the senior adviser in the Finance Ministry. On his return to Sri Lanka, he served as a senior manager of the then Free Trade Zone under the chairmanship of Upali Wijewardane. He later established his own legal practice, with his wife as a partner, and served as corporate lawyers to over 25 foreign and local investment companies. It was my privilege to count him as a dear friend for nearly 70 years, since we first met in the Lower Lincoln Dorm, where Elmore Perera was the prefect in charge and Dunstan Fernando, the master in charge. Hema was both an excellent student and a prankster par excellence. Because he was a student at Richmond, his uncle M.D. Gunatilake funded the building for the old ‘Practical Shop’ at Richmond. I was lucky to have close contact with him and his family, ever since we met as children at Richmond and spent our school holidays at each others' homes. Since we left Richmond, we had been in constant contact visiting each other often, no matter which part of the world we lived in. He accorded me the honour of giving away his daughter Enoka. His other daughter is Rohini. He was a man endowed with great wit and he used it with plenty of sarcasm to keep those around him constantly entertained. He was an ardent cricket fan and horse racing was his hobby. A deeply religious person, he took a delight in motoring regularly to the ‘Sri Maha Bodhi’ in Anuradhapura and Kataragama in the South. He had a good life all around, and when the time came, he left in his sleep with a smile. The Bhagavad Gita reminds us that: Death being the inescapable destiny of all who are born, one has no cause to grieve. As such, while I, along with those who knew him will dearly miss him, it is time to celebrate a life that was well spent and enjoyed to the hilt. “I am the master of my fate, I am the captain of my soul,” said Nelson Mandela. Our father, Hemachandra Perera, embodied this spirit all his life. He lived his life to the fullest; he travelled extensively and visited many places around the world; he always enjoyed company and entertained a lot, and joked a lot, his biting wit and sarcastic humour and his forthright manner was suffered by his friends who loved him. He was always ready to help any friend and lend a hand; he always made himself available when his friends and relatives sought his advice. He was also quite a prankster. He was without doubt the best father anyone could ask for; though he was a doting father he was also a strict disciplinarian; he shaped our lives in his inimitable manner, offering guidance and support at every juncture of our lives. We are who we are, because of him and our loving mother. We are grateful to them both. They taught us the value of caring for people, of the value of education and the importance of the family and perhaps most important of all, to live our lives filled with joy and compassion for fellow beings. Our father’s spirit will be with us all our lives; yes he will be remembered lovingly by us always. I consider it my obligation and duty to write few words about my close friend, former Attorney General Chithra Ranjan de Silva whom I met in 1973 when he was the State Counsel at the High Court of Gampaha. We developed our friendship faster than I expected and lasted until his passing away in 2013. He was more than a brother to me. He introduced me to his friends and officials and proudly said “Our friendship is inseparable”. An attribute he retained in ample measure throughout his career in the Attorney General’s Department was a sense of absolute commitment to any task he was entrusted with. His career was a complete success achieving the most prestigious position as the Attorney General of Sri Lanka. And, his forte was his childlike simplicity; proven integrity, commitment, and fierce loyalty to whosoever he served. These are exceptional traits and a strange mix in him as a senior officer of the Attorney General’s Department. His admirable quality was that he always recognised and appreciated the good work done by the Police Officers, particularly, CID officers handling sensitive and important investigations in a professional manner and giving credible evidence in court. In 1981, I was the ASP at the CID handling and supervising all investigations conducted under the Prevention of Terrorism Act. Tilak Marapana, PC was the Deputy Solicitor General supervising all investigations conducted by the CID and he was assisted by C.R. de Silva, then Senior State Counsel and Mohan Peiris, then State Counsel. We developed our close association, particularly, during this period. C.R. 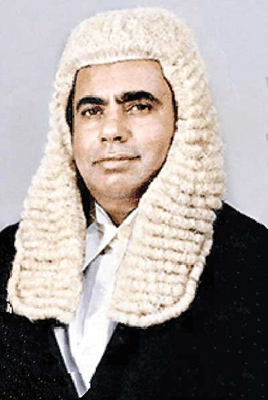 de Silva was appointed to supervise this Division when Marapana proceeded to Hague to take up an appointment at the UN International Criminal Tribunal.There was one constant characteristic which shone through the whole of his career in the AG’s Department; the courage of his convictions and the firm refusal to compromise on what he believed in. The adage “friend in need is a friend indeed” can proudly be referred to my friend. He was a good dependable friend willing to help a friend or junior. His time was generously at the disposal of any friend, junior who stood in need of his help, support and advice especially on legal issues related to Law and /or any other personal matters. I am personally aware of the intensity of his involvement in exceedingly useful charity work because of my close association with him. He confided to me that now Minister Malik Samarawickrama, his childhood friend helped in many ways and funded his charitable work. He was a national asset especially for his untiring efforts in preparing the report of the L.L.R.C. as its chairman. His report and the recommendations were accepted by U.N and he was lauded for his courage. He was indeed a giant of our times, indomitable in courage, steadfast in purpose, total in commitment , clear sighted in vision, irreproachable in character and simple in manner. My clearest memory of him as a lawyer in both the official and unofficial bar was his sharp and probing mind. He was an epitome of gentility who was ever unassuming and unpretentious. I am happy that my son Sajith and his son Shehan de Silva who joined the AG’s Department together as State Counsel are good friends and I am confident that they will continue our friendship. In the midst of life’s challenges and upheavals, my close association with C.R. de Silva who was my mentor, will ever remain with me and my family as a shining memory.